“This is my rain gauge and I take off the top and I read how much is in there. And if it’s more than an inch it goes over and I collect it in here and then I pour it in and measure that. It’s an easy job to do. All you have to do is be able to read numbers," Lindemann said. Lindemann, a retired New Mexico State University professor, is part of a network of volunteers who measure the amount of precipitation that falls where they live. It’s called the Community Collaborative Rain, Hail and Snow network, or CoCoRaHS, for short. The nonprofit community science project began in 1998 at Colorado State University and expanded to New Mexico in 2005. 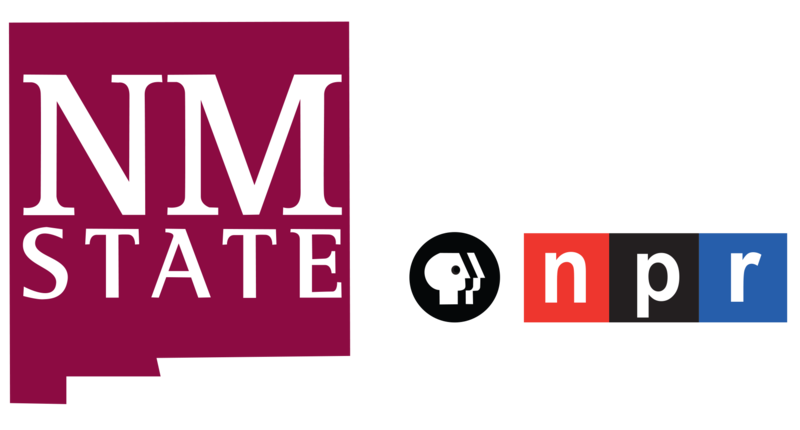 State Climatologist and NMSU professor Dr. Dave DuBois is the state coordinator for the program. “We have about 500 active observers in New Mexico and on a good day we have about 100 in Doña Ana County, so there’s quite a bit. On an average day we get maybe 50, 60 here in Las Cruces so we have a nice community [of] observers," DuBois said. To be an observer, participants sign-up on the CoCoRaHS website where they can buy an official rain gauge and register for trainings online or in-person. 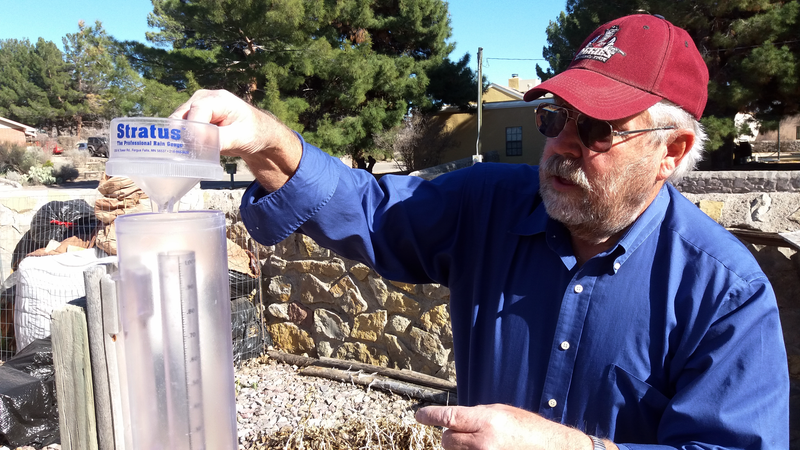 Retired NMSU Professor Dr. Bill Lindemann demonstrates how to measure his CoCoRaHS rain gauge. While anyone can join, DuBois said the average observer is a retiree with the time and enthusiasm to collect data at 7 each morning. Volunteers submit that data to the website, which maps precipitation levels in cities and counties in all 50 states. Since it’s available to the public, everyone from farmers to hydrologists to insurance adjusters use CoCoRaHS. People like Connor Dennhardt, a meteorologist at the National Weather Service in El Paso, which monitors eight counties across far west Texas and southwest New Mexico. He said many researchers use CoCoRaHS to understand drought and flooding. Dennhardt said the data is most useful during the summer monsoon when thunderstorms strike. Because rain doesn’t fall the same everywhere, he said the density of volunteers across southwest New Mexico helps the National Weather Service better understand where precipitation lands. As a soil science professor, Lindemann said he’s interested in monitoring weather to study issues like crop growth and soil productivity. Through CoCoRaHS, he’s also found out how fickle rain in Las Cruces can be. Lindemann’s rain gauge is dry on this day’s reading. But both DuBois and Dennhardt say recording days when there’s no precipitation is just as important as days there is. “What we’re trying to measure with CoCoRaHS is not only rain totals and seasonal totals for precipitation but also drought. So, measuring zeroes tends to really help with that and identify problem areas where we can better forecast drought in the future," Dennhardt said. As Dennhardt, observers who continue to participate in the program aren’t just recording their daily weather observations; they’re building a climate database of their location. That can help them understand the difference between weather and climate. As the saying goes, "Climate is what you expect, weather is what you get." In addition, DuBois said coordinators at all levels are on the lookout for errors to ensure readings are accurate. He said there’s still a lot of ground to cover and gaps to fill across New Mexico, especially between urban areas. While new observers are always welcome, DuBois said CoCoRaHS is just one of many citizen science programs around. “We’re just taking part in measuring precipitation. There are other weather citizen science programs out there that compliment what we do. So, we major in precipitation. That’s our focus and we do it pretty well and that’s kind of our goal is to have fun and actually take real data," DuBois said. For Lindemann, the value of taking part in CoCoRaHS is the fact that he’s part of an entire network contributing to weather and climate science on a national scale. “Not just Las Cruces, not just New Mexico but the whole country. And so I can get on my computer in the morning and I can see how much and if it rained in Bowling Green, Kentucky or in Miami, Florida. And so I think that’s very useful not only from an agricultural standpoint but from an environmental standpoint and then just your personal life," Lindemann said. Kentucky and Florida may get more rain, but when it comes to enthusiasm for science, there seems to be plenty in New Mexico’s forecast.